For Her comes in both Eau De Toilette and Eau De Parfum. 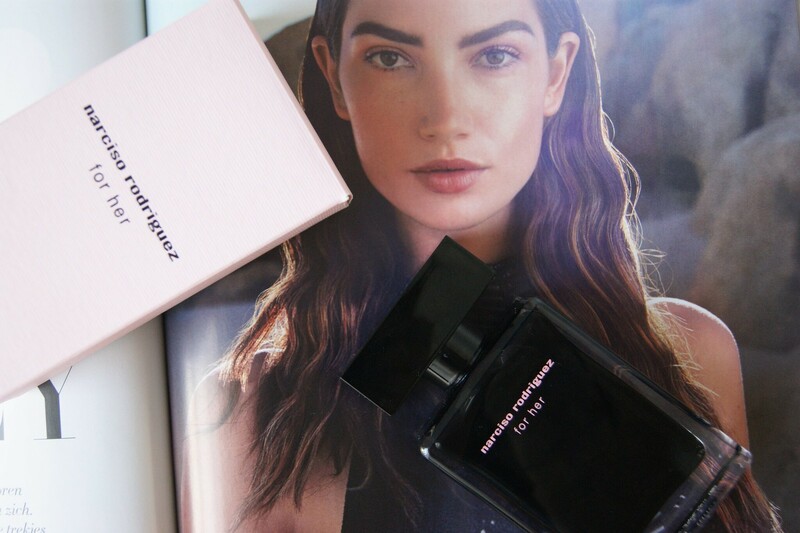 The EDT, in a black bottle and a soft pink box, was launched first in 2004. In 2006, the EDP followed, this time in a soft pink bottle and a black box. The heart of both fragrances is musk, but their composition is slightly different. The EDT is a sharper and a more aggressive scent, while the EDP is said to be softer and sweeter. As mentioned above, the For Her EDT comes in a black bottle and soft pink box. The bottle is simple and clean, just the way I like it. It's kind of heavy, which might be an issue for those who like to carry their perfume in their handbag. And because the bottle is pitch black, it's impossible to tell how much perfume there's left inside. It's not a big deal to me, but it can be difficulty sometimes. Benzyl Salicylate - A chemical compound and is often used as an additive for fragrances (among others). It usually serves as a component and fixative in floral perfumes. Butylphenyl Methylpropional - Also known as Lilial. It's made synthetically and therefor can't be found in nature. It's often used to fortify the body of a perfume and is usually the middle note. Because of irritation and allergic reactions, there's a restriction on the use of it in cosmetic products. It must be indicated on the ingredients list if the fragrance contains more than 0,001 % of it. Butyl Methoxydibenzoylmethane - A synthetic that protects your cosmetics from being ruined by UV rays. Benzyl Alcohol - A bacteriostatic preservative at low concentration in cosmetics (among others). Hydroxycitronellal - A synthetic ingredient, known for its odor similar to a lily of the valley. Hexyl Cinnamal - A common additive as an aroma substance and is found naturally in the essential oil of chamomile. Geraniol - Has a sweet, rose-like odor and occurs naturally in essential oils, such as geranium, rose and lemon. Ethylhexyl Methoxycinnamate - An organic compound and it also protects your cosmetics from being ruined by UV rays. Linalool - A naturally occurring substance that is used to make fragrances and flavors. Cinnamyl Alcohol - An organic compound used to scent cosmetics. Limonene - A naturally occurring fragrance compound which is found in the skin of citrus fruits. 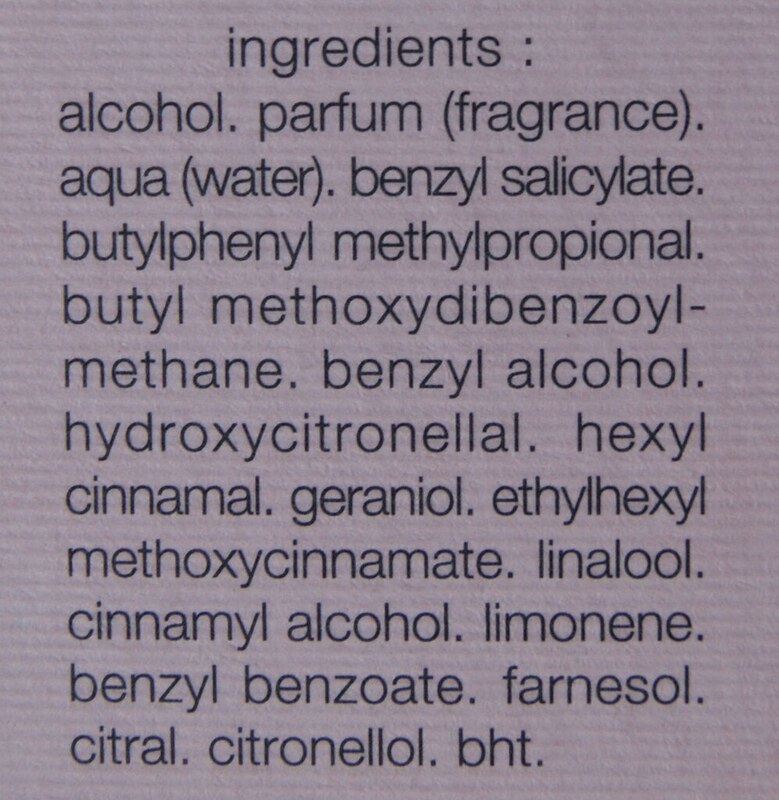 Benzyl Benzoate - An organic alcohol which is used as a fixative in a fragrance. This makes sure that the scent sticks around longer. Farnesol - An organic compound. It is used to emphasize the odor of sweet, floral perfumes and also has a antibacterial effect. Citral - It has a strong lemon odor and is used in perfumery for its citrus effect. Citronellol - Occurs naturally and is often used as a flavor in a fragrance. In cosmetics, the use of Citronellol has to be mentioned if it exceeds a certain limit due to allergy issues. BHT - An antioxidant. It slows down the deterioration of cosmetics caused by chemical reactions with oxygen. For Her is the perfect scent for women who love a stronger, heavier and more intense scent. Those who are a fan of musk should definitely have a sniff at it. Even though some say the scent is more appropriate for winter, I have to disagree: I've been wearing it all summer (and will continue to wear it during winter). It's a particular scent, so I'd be careful with this one if you're thinking about gifting it to someone. Make sure that you get them to smell it first somehow. I've had some troubles finding the notes in this perfume, but after checking dozens of websites, I think I've managed to find them. In Belgium available at ICI PARIS XL. Amazing post and lovely pics! Thanks! Have a lovely weekend as well. 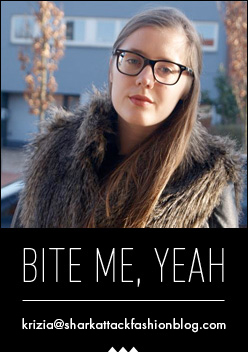 I'll check out your blog real soon. Ik hou wel van zware geuren dus deze geur klinkt perfect. De flacon is erg mooi! Oh klinkt als een geweldig parfum! En wat een mooie foto's ook!